Cross stitch is the best-known type of colour embroidery and is one of the oldest existing embroidery techniques. In folk art world wide there are traditional cross stitch patterns that differ not just in shape and colour but also in technique. Cross stitch charts are usually illustrated with squares, in colours or with symbols representing colours. For example, some cross stitches are formed on both the right and wrong fabric side, or there are cross stitches on the right side and box stitches on the wrong side. In our latitudes the stitches on the wrong fabric side are kept vertical as often as possible. All needlework fabrics are suitable for cross stitch as long as the warp and weft thread count is the same so that the stitches remain square. Personal taste, intended use and, last but not least, your patiences usually determine whether you select a closely woven, fine fabric or a coarse one. As practically all needlework fabrics can be recommended for cross stitches, we list here fabrics for particular purposes or cases. AIDA CLOTH a special weave with intersecting groups of threads that form clear holes, or stitch squares. Ideal for children to learn cross stitch on are 3611 BINCA (2.5 squares per cm or 6 per inch), 1006 AIDA 8 count (3.2 squares per cm) There are also fine Aida cloth types such as 3793 AIDA 18 count (7 squares per cm) on which very artistic cross stitch can be worked and 3251 AIDA 16 count (6 squares per cm) are the best for fine works. 1007 AIDA 11 count (4.3 squares per cm) and 3706 AIDA 14 (5.4 squares per cm) are the most popular stitching range. All these fabrics have in common the fact that the number of squares is clearly defined and that counting single threads is not necessary. Plus, thread ends can be neatly worked in on the back. If you are looking for a quick needlework project, patterned tablecloth fabrics with Aida cloth areas are available. 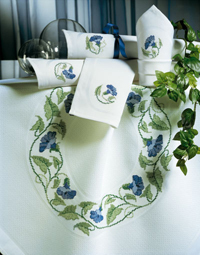 Tableware fabrics are available for cross stitch motifs already woven in. It could not be simpler – all you do is embroider over the motifs. Ready-made table centre cloths, runners, tablemats and serviettes/napkins are available with Aida cloth areas, e.g. tablewares such as WESTERLAND with a large, square centre. The damask centre tablecloth RONDO has a round Aida cloth area in the centre and LOTUS. For a quick gift the SONATE and AMELAND serviettes or napkins with approx. 5 cm (2 inches) Aida cloth areas are just the thing. Are available in many widths, colours and with different edge treatments, e.g. 7002 is 2.5 cm (1 inch) wide, 7107 is 5 cm (2 inches) wide, 7008 is 8 cm (3 inches) wide, etc. Practically all embroidery threads and yarns available are suitable for cross stitch. The important thing is that thread or yarn and fabric match in weight. Stranded cotton or embroidery floss is generally used because it's available in the widest colour range and can be used for different stitch sizes as the strands can be divided. The rule of thumb is: for a stitch gauge of 12 to 16 per inch, use 2 strands of floss, for 10 or 11 per inch use 3 or 4 strands. It also depends upon the desired effect, i.e. more if you want the stitches to stand out, to fully cover the fabric or less to be delicate and transparent.